A trip to the lumber yard!! So today I was able to sneak out of work and go get the lumber for my countertops. Originally we were going to make the countertops from 8/4 solid walnut. Rough cut lumber thickness is measured in quarter inches. So eight quarter (8/4) is two inches. After doing some research and looking around we decided to go with solid hickory. Not only is it a harder wood than walnut but also cheaper. 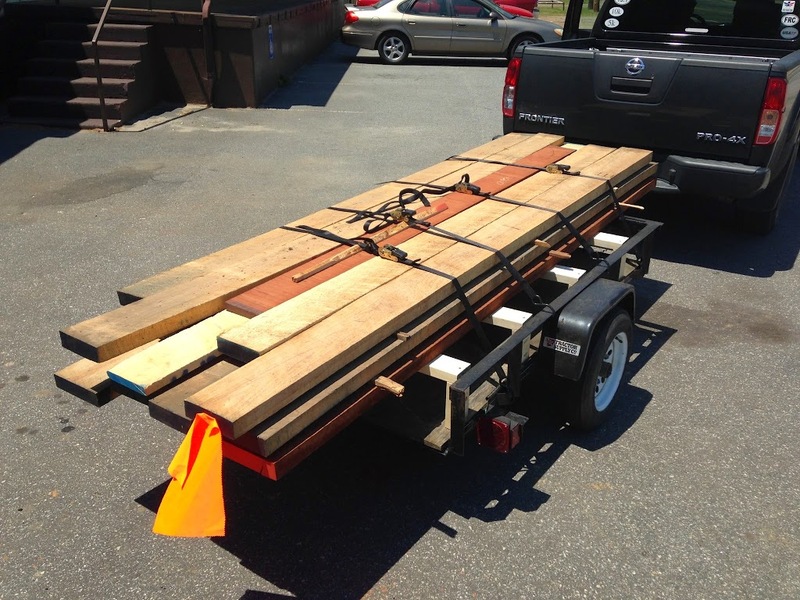 I was able to borrow a small trailer from a friend of a fellow woodworker who was coming along for the trip. 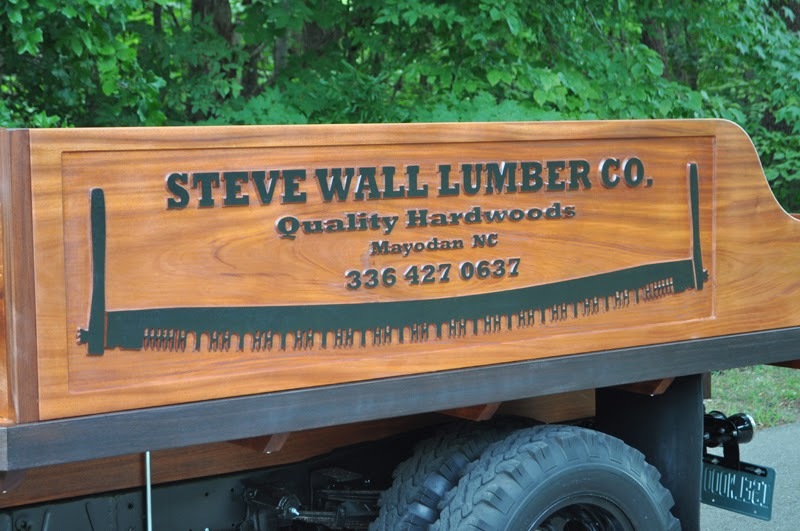 Several other woodworkers I know had recommended Steve Wall Lumber for purchasing the material for the countertops. I can get Red Oak and Poplar from a local Saw Mill here in Raeford but if need anything more “exotic” I’m going for a drive. Wall Lumber is located about 25 miles north of Greensboro, NC. We hooked up the trailer and off we went. A short two and a half hours later and we pulled into their parking lot. At that point I felt like a kid in the candy store. The clouds parted and angels even began singing. Before me stood a huge warehouse full a kiln dried goodness. The smell of fresh cut lumber permeated the air. From just about ever domestic hardwood to some of the most popular exotics there was lumber for as far as the eye could see. Not only did they have a huge selection of lumber milled from thin stock project packs to huge slabs with live edges. The staff were very friendly and knowledgeable. They also offer milling services, moldings, and a wide assortment of sheet goods. This was a pure field trip for a couple of woodworkers. But business called. I selected a little over 120 board feet of Hickory, some Hard Maple, and a little Sapele. This was my first time buying real “exotic” hardwood. It is marketed as a good alternative for Mahogany. The Hickory is for my countertops and the Maple and Sapele will be for a frame for a couple of American Flags flown over Afghanistan (upcoming project). Now I’m not sure if I’ve mentioned this lately but I have the most amazing and loving wife EVER. 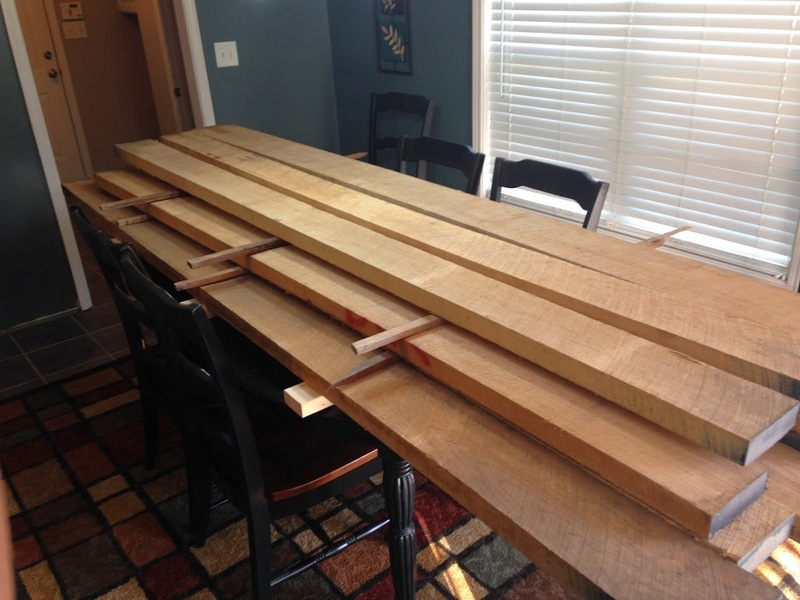 What wife out there openly allows for the storage of over a 120 BF of Hickory on the kitchen table? Mine does!!! I can’t wait to mill this lumber down and hope it turns into kitchen countertops. At least the easy part is done. Thanks again to guys at Steve Wall Lumber. I will definitely be back (maybe with a bigger trailer).